AWD CIVIC WORLD RECORD! 8.1@179MPH! 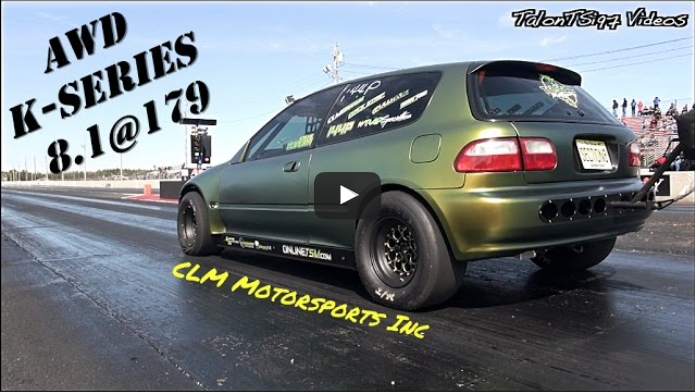 CLM Motorsports Inc brought out their AWD, K-Series, Turbo Swapped Civic Hatch to IFO Atco and tore the house down, with new best after new best settling in at 8.1@179 making this the fastest AWD Civic. Its only a matter of time before this cracks into the 7s sec barrier. Just watch the video of this awesome K-series AWD Civic below and leave a comment and share this one with others! Nitrous on a Lambo? That’s a New One! 900 HP Supra vs Nitrous C6 Z06! 1100HP Sleeper Sequential Evo IX 60PSI of BOOST!